Set in the foothills of the majestic Taurus Mountains in Islamlar on Turkey's Mediterranean coast, two-bedroomed Villa Zeybek ticks all the boxes for a relaxing holiday retreat. Peaceful location. Set in the foothills of the majestic Taurus Mountains in Islamlar on Turkey's Mediterranean coast, two-bedroomed Villa Zeybek ticks all the boxes for a relaxing holiday retreat. Peaceful location? Check. Private pool? Check. Complete seclusion yet close to a beach and amenities? Check. Check. Check. The modern white-washed building has clean lines, floor-to-ceiling windows letting in the natural light and elegant interiors brought to life with pops of deep blues, reminiscent of the sea. All the rooms are designed with your comfort and relaxation in mind. Contemporary furnishings include large corner sofas adorned with cushions, plush beds and unique artwork, combining beautifully to create a true oasis of calm. The rooms have a large balcony offering sweeping views of the countryside, and there are seats to survey the breath-taking landscape from. The bedrooms are both en-suite, one with a Jacuzzi and both have walk-in power showers for a serene spa-like feel. The exclusive hillside villa also boasts a large terrace and just a short drive from Patara's sandy beach. The large swimming pool has two wading pools incorporated – perfect for a cooling dip or for smaller children to splash – and there's an outside shower, fully-shaded dining area and outdoor furnishings. You can reach the open-plan living, kitchen and dining area direct from the terrace. 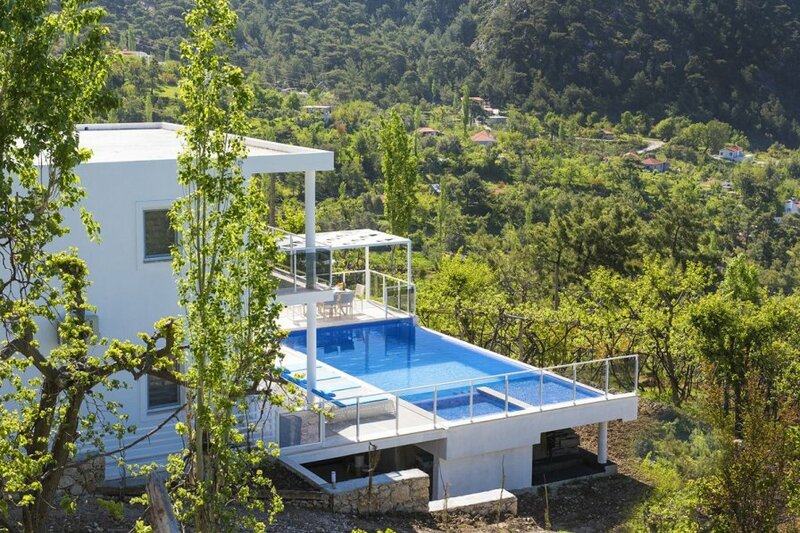 Villa Zeybek is in a unique and serene setting amidst the olive groves and pine trees in the beautiful mountain village. Islamlar is renowned for its trout farms; restaurants serving fresh trout, slow-cooked lamb and other local delicacies, and is only a 15-minute drive to the lively resort of Kalkan with a weekly fruit and vegetable market and shops. If you prefer to dine at home and soak up the enchanting sunsets, there are nearby markets selling fresh and organic produce. This beautiful part of Turkey is the perfect place to rest or explore the exciting cultural and historical sites nearby. Villa Zeybek has a picture-perfect setting in Islamlar, a twenty minute drive from the golden sandy Patara Beach, where the mountains rise behind you, and the Mediterranean sea sparkles in front. The beach is 12km-long, so you're sure to find a private sunbathing spot away from any hustle and bustle. With clear waters, the beach is perfect for swimming and snorkelling. Keep an eye out for loggerhead turtles, as these amazing creatures build their nests up the beach. This popular village in Turkey is also known for its trout farms and restaurants serving their freshly-caught catches. From Islamlar, it's an easy 15-minute drive to Kalkan; a vibrant port city celebrated for its waterfront and roof-top restaurants, exquisite harbour dotted with Turkish wooden boats and historic old town area which extends back from the sea. Wander the streets with houses draped in brightly coloured bougainvillaea flowers or dine on a roof terrace restaurant with spectacular views of the town. There are also plenty of swimming beaches in Kalkan and Turkish Baths for a relaxing end-of-day massage. Nature lovers won't want to miss exploring the pine tree-lined Taurus Mountains. With deeply cut valleys and canyons, they're an ideal place to hike. You could also join the popular Lycian Way – a long-distance footpath that takes you around the coast. The route stops at exciting sites including the ghost village of Kayakoy near Fethiye. For even more things to do, the bohemian town of Kas is a 30-40 minute drive, while the resort town of Fethiye is a one-hour drive away. Other fun escapades include boat tours to the small island of Kekova where you can snorkel and explore the part sunken ruins of Dolchiste, an ancient town which was destroyed by an earthquake during the 2nd century. There's also plenty of opportunities to take part in water sports like scuba diving and sea kayaking and more than enough craggy coves and caves for you to explore.